At the start, Kettle of Fish sets itself up to be just another tale of a bachelor coming of age but quickly evolves into a screwball comedy with the arrival of the sunny and sassy Gina Gershon. Playing a British scientist researching amphibian behavior, Gershon instantly calls to mind Cary Grant’s performance that most likely inspired her in Howard Hawks’ Bringing Up Baby when she arrives on the scene to sublet professional bachelor Matthew Modine’s apartment in New York. 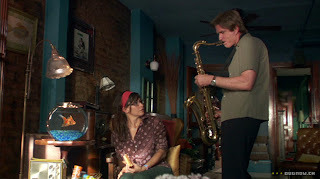 Foolishly Mel-- jazz saxophone playing Modine-- has prematurely decided to move in with a younger girlfriend and, perhaps as equally predicting it will fail as the audience, makes the condition to Gershon that she only has the place temporarily for a month just in case. Of course, long before the month is up, he comes crawling back and despite their arguments, the two cohabitate for awhile until she finally finds a place of her own. Meanwhile, despite the fireworks ignited by the two, hopelessly romantic and morally clueless Mel meets a woman he believes is Ms. Right (Christy Scott Cashman) en route to her own wedding to yogurt mogul Bruce (Fisher Stevens) and impulsively takes a job as an elevator boy in her apartment building to try and woo her away from her self-involved new husband. While we tire of Mel pretty quickly despite the charm of Modine (who also served as one of the film’s producers), we find ourselves dazzled by the comedic skills of fast talking Ginger (Gershon) who begins studying the way that Mel’s saxophone enthralls his goldfish Daphne while trying to ignore her budding attraction to the musician which culminates in a senselessly clichéd drunken near make-out with the object of her desire. Yale graduate Claudia Myers crafts an affable yet contrived little romantic sleeper that, now making regular rounds on premium movie channels may garner more interest from channel surfers and despite the predictability, I was entertained throughout and once it was over, began searching through my DVD collection for Bringing Up Baby.